Achieving high quality cross-sections of almost any material, revealing the internal structures of the sample with scarcely any deformation or damage was never before more convenient than now, using the Leica EM TIC 3X. 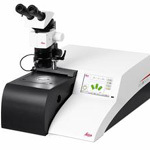 The Triple Ion Beam Cutter, Leica EM TIC 3X allows production of cross sections of hard/soft, porous, heat sensitive, brittle and heterogeneous material for Scanning Electron Microscopy (SEM), Microstructure Analysis (EDS, WDS, Auger, EBSD) and, AFM investigations. Three ion beams (individually controlled), cooling stage and multiple sample stage ensure milling at high rates, cutting broad and deep into the sample resulting in high quality cross-sections. 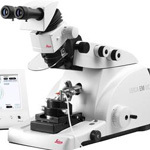 Unique Triple Ion Beam System optimizes the cross-section quality and reduces working time with its ability to cut broad and deep at high speeds. Up to three samples can be processed in one session. 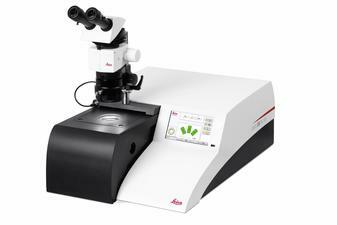 This makes the Leica EM TIC 3X a perfect instrument for high through-put laboratories. High quality, low temperature processing of heat sensitive samples such as rubber and water-soluble polymer fibers can be prepared by cooling down the sample holder and mask to -150° C.
In addition to slope cutting, the same holder can be used for cleaning and contrast enhancement.